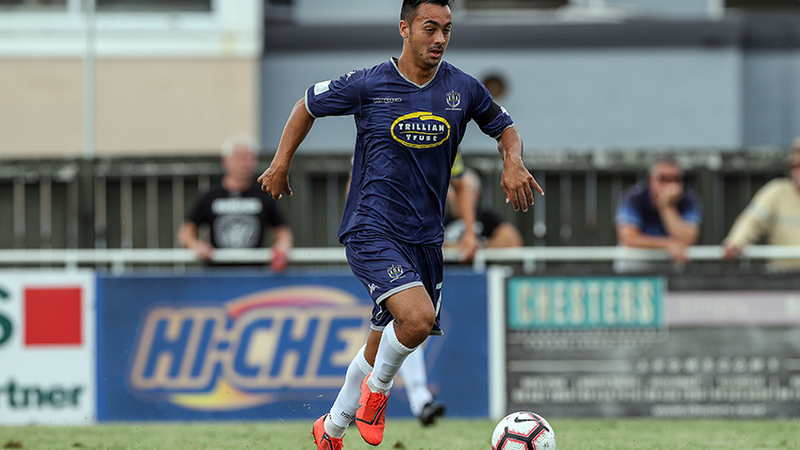 AUCKLAND, New Zealand - Auckland City FC's ISPS Handa Premiership semi-final defeat could be the motivation to lift the Navy Blues to a do-or-die win over Lae City on Saturday. Auckland City FC were humbled 3-1 by Team Wellington to be bundled out of the ISPS Handa Premiership two weeks ago thus ending nearly 16 months undefeated in all competitions locally and in Oceania. It was a hard slap for the Ramon Tribulietx-coached side who then had to watch on as league runners-up Eastern Suburbs AFC coasted to their first title victory in 48 years, thrashing Team Wellington 3-0. With the future of the ISPS Handa Premiership, OFC Champions League, FIFA Club World Cup and even the Hyundai A League all uncertain, a level of pathos was added to the pain of defeat. Tribulietx, who has guided Auckland City FC to three domestic championship wins, said the pain of defeat and the lessons learned from it have been absorbed and could be used to help the Navy Blues kick on and beat the Papua New Guineans on Saturday. "We were very disappointed with the Team Wellington result. We conceded two goals out of nowhere and paid a big price for it - we've learned a lesson. "We became impatient with our football, even in the first half. At 0-0 we were impatient and that doesn't go well with our style. "We've talked about it, reviewed it and gone over it and acknowledge we could've done better. Sometimes football is very cruel and when we went 2-0 down against the run of play we have learn to be better. "We start that on Saturday when we face Lae City in the OFC Champions League," he told www.aucklandcityfc.com. Lae City come into the match with injury worries of their own and having conceded six goals in their three group matches. They qualified for the last eight after they finished second in Group A behind New Caledonia's Hienghene Sport. Lae City beat Malampa Revivors 4-2 thanks to a Raymond Gunemba hat-trick and a goal by Nigel Dabingyaba, a result sandwiched between draws with AS Tefana (3-3) and Hienghene Sport (1-1). Tribulietx says it will be vital for his players to get back into action quickly so they can put the Team Wellington result firmly behind them. "It will be good for us to get on the pitch and play a better game. The team has responded very well to what happened and we will see how that comes together on Saturday. "Lae City are familiar to us. We've played them before many times and they are a classic Pacific team with two or three very dangerous players who can hurt you in random situations. "Nigal Dabingyaba and Raymond Gunemba and Robert Bika can catch you if they get in behind and they can hurt you. They're very good one on one and they're very quick. Once they get a yard on you they're a big threat. "These situations can be difficult on Kiwitea Street because the pitch is so small. We have to defend those long balls from the back and through the middle -they are a big threat," he said. Lae City's strength is their attacking prowess but their weaknesses start in defence. Tribulietx says the key to victory for Auckland City FC is no secret. "We have to be very good on the ball, control possession and learn to be patient on the ball. The price we paid against Team Wellington was through a lack of patience. "This match is at home and we've worked hard to get to this point so this is a reward in some ways. We've brought in nine new players and had to learn new systems and we've played better and better. "We're at the business end of the season and we have to be ready for what that holds," he added. Saturday's game kicks off at 2pm NZST and is live streamed by OFC TV via www.oceaniafootball.com. AC (squad chosen from): 1. Enaut ZUBIKARAI (GK), 2. Darren WHITE, 3. Jackson WOODS, 5. Angel BERLANGA (c), 6. Josh JONES, 7. Cam HOWIESON, 8. Albert RIERA, 9. Thomas DRILLIEN, 11. Fabrizio TAVANO, 12. Dylan MANICKUM, 14. Jordan VALE, 15. Dan MORGAN, 16. Yousif ALI, 17. Reid DRAKE, 18. Ruben PARKER (GK), 19. David BROWNE, 20. Te Atawhai HUDSON-WIHONGI, 21. Maro BONSU-MARO, 22. Omar GUARDIOLA, 23. Alfie ROGERS, 24. Cam BROWN (GK).